Goalkeeper Dimi Konstantopoulos says Middlesbrough's defensive record is a source of pride and the cornerstone of their Championship promotion bid. Friday's 1-0 win against QPR kept Boro in the top three, just two points behind leaders Hull City. It was also the Teessiders eighth clean sheet of the season, with just 12 goals conceded in 17 league games. 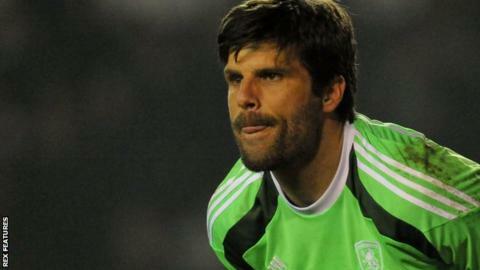 "We don't like conceding goals and that goes for the whole team," Konstantopoulos told BBC Tees. "It's a base where we start from - we pride ourselves on keeping clean sheets." In addition, Boro's 25 goals make them the third most prolific side in the division, to add to the third best defensive record, goal difference and placing. "The lads at the front work hard as well, we know when we don't have the ball we have to defend together," said the Greece international. "When we do have the ball we have the players to cause them problems." Konstantopoulos, 36, has been an ever present for the Teessiders in the league this season, keeping out Tomas Mejias in the starting jersey. In front of him Ben Gibson, Tomas Kalas, Fernando Amorebieta and Daniel Ayala have all traded places in the centre of defence, although the rotation has not had an impact on form. "The lads at the back, we help each other, we have great understanding and even despite rotation we know each other well and that's because we're close off the pitch," said Konstantopoulos. "We have a good dressing room and basis for a good defensive record."